I did this with ignition key on (engine off). I've also seen a post mentioning that the high-speed relay (magenta in color) if bad could also cause this, where the HS side works but LS does not. Long-story-short, how can I manually test the low speed fan? CJ, Just an update on the low speed fan issue. Reader's Digest version; the high speed relay was the culprit. After studying the wiring schematics, in the Bentley, it shows the if the high spd. relay doesn't function properly it leaves the circuit open to the low speed side. Jess is correct. The HS relay contact is interlocked with the LS relay. Last edited by bazar01; 07-10-2017 at 01:44 PM. Thanks for the feedback...... Yesterday I did pull the HS relay (magenta in color?) and pulled the cover off. The internals seemed as-new, although I guess something could be amiss there (the diode) and I'd not know. 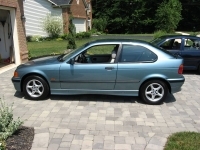 I'm gonna run to BMW today and pick up a HS relay and a new temp switch. I never sat down and actually studied the schematic. All credit should go to Russ(Noneone2) and Bazar01 for taking the time to figure this out. Hats off to you guys! Bazar01, the schematic really gives a good visual understanding of how the circuits function. I think the reason it's confusing to people is because if the fan only works in high speed mode, one would think the high speed relay is functioning properly and since it doesn't operate in normal speed mode, the normal speed relay must be the culprit when in fact it's exactly the opposite. Replace the HIGH speed relay and it should fix the problem and allow the fan to work in normal mode again. Of course this probably only covers MOST cases. There's still a very slim possibilty that a faulty temp switch, pressure switch, fuse or fan motor may be the culprit, but I think it's safe to say that if your fan comes on when you turn the A/C on, but doesn't kick on when the engine idles for extended periods, you should probably replace the high speed relay first. Thanks to all.....I'll update the posting after I pick up the relay and switch today. Good stuff guys! Does anyone know the parameters for the fan to run in LOW? I'd assume a fully warmed engine, in the summer, sitting still at idle would turn it on? Anyway, I don't ever recall seeing my fan run when the A/C was not on. Last edited by kaamacat; 08-05-2011 at 03:13 PM. Engine fully warmed up, temp gauge sitting at 12 o'clock, idling in traffic or in the driveway with the hood open, you can hear\see it. If the fan don't run in low speed, there are 3 possibilities. Last edited by bazar01; 08-05-2011 at 03:37 PM. Anyone have the part number for the high speed relay? I just went out and checked my car, fan only comes on with A/C. Here you go. Assuming this purple one is really it! Ok well now I feel dumb, lol, I should have realized it was printed on the darn thing. Thank you Cirrus, you are always a great help. It only runs on high-speed I guess mine needs a new relay. I did replace the HS relay along with the dual-temp radiator sensor switch, and no low speed. (Does anyone know if you can still do the override for the lowspeed from the sensor plug? The HS does override fine. But make sure to identify the right LS relay and the right 30 and 87 pin sockets on the board cause they are not the same location as the ABS's above though. Here below is my 1994 318 sedan fuse box layout. The LS relay location is #15. I’m not sure whether is it the same as your guys’ ti? However, this bridging does not tell that there is no faulty over the trigger wiring harness form the sensor to the dme and from the dme to the relay nor the relay is good since we have override them all. It just tells us the fan and the fuse are good though. 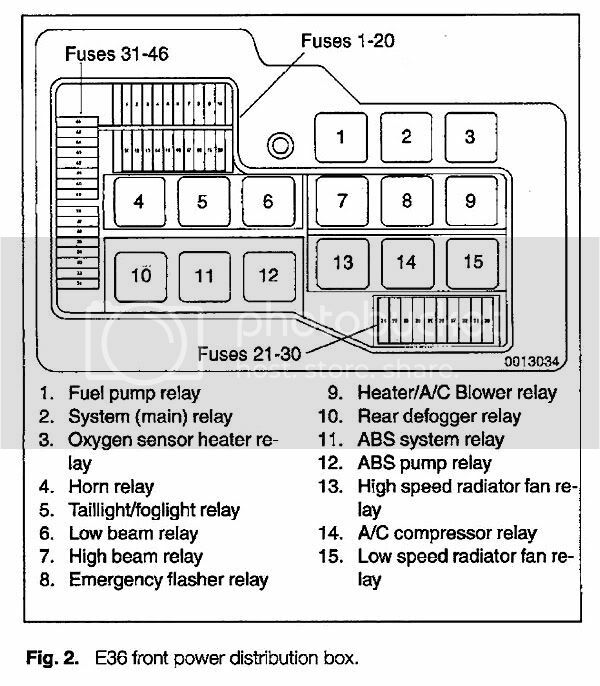 The way to test the relay is just switching the LS relay to the A/C compressor relay or #14 in the fuse box layout above, if they both are the same as those of mine, and test run the A/C. If the compressor works properly, the relay is good. The way to check or override the LS signal is kinda tough though. You have to rewiring the trigger harness. 1st, tap on the LS trigger / green stripe or whatever color from the sensor socket cable. Next, locate and tab the other side of the rewiring cable on the 85 pin socket wire under the relay/fuse holder board. Do you guys follow me? Last edited by 9G3Series; 08-09-2011 at 05:11 PM.